Sundays — Sat evening: 5 p.m.; Sun: 8:30 a.m., 11 a.m.
Daily — Mon–Fri: 8:15 a.m.
Archbishop Kelly clustered Mother of Good Counsel and Transfiguration of Our Lord parishes on June 20, 2007, and Father Bill Medley became pastor of both parishes. A merger creating a new parish would follow in 2008. The name of the new church, Saint Bernadette, was chosen on the 75th anniversary of the canonization of Bernadette as a saint and on the 200th anniversary of the Archdiocese of Louisville. In 2007, the regional Catholic school, Saint Mary Academy (SMA), was formed as a result of dialogue between the parishes of Immaculate Conception in LaGrange and Mother of Good Counsel in Louisville. The name of the new school, Saint Mary Academy, was chosen because it honors Mary, who is both the Immaculate Conception and Mother of Good Counsel. SMA is now solely the parish school of Saint Bernadette Parish. SMA was named a Blue Ribbon School in 2015. Saint Bernadette Parish was located on eleven acres in the growing area of Norton Commons, on the border of Oldham and Jefferson counties. Celebrated on April 16, 2008, the funeral of Father Herb Lattis, the former pastor of Transfiguration Parish was the first funeral in the newly-formed parish. On April 26, 2008, Archbishop Joseph Kurtz officiated at the ground-breaking ceremony of the Saint Bernadette Parish Center and Saint Mary Academy. On August 19, 2009, classes began in the new Saint Mary Academy building, and on August 31, 2009, the parish staff moved into the complete parish center on the Saint Bernadette Parish property in Norton Commons. Saint Bernadette celebrated Mass on two campuses for the first 17 months. On September 19, 2009, members united for Mass at the Saint Mary Academy gym. In February of 2010, Father Bill Medley was appointed Bishop of the Diocese of Owensboro, and Father Terry L. Bradshaw was named pastor of Saint Bernadette Parish. 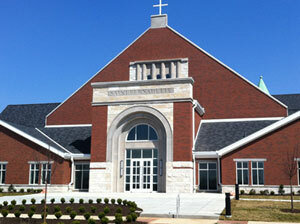 On May 15, 2011, Archbishop Kurtz officiated at a ground-breaking ceremony for Saint Bernadette Church. The dedication of the new church was held on April 21, 2013. In October 2015, Father Terry Bradshaw was named pastor of the Basilica of Saint Joseph Proto-Cathedral, and Father Bill Fichteman was named Administrator Pro-Tempore until June 2016. That month, Father Jeffrey Nicolas was named the third pastor of Saint Bernadette. Today there are 2011 households registered (over 6,300 parishioners).